Almost since the time I started flying R/C, I’ve been interested in taking aerial photographs from my models. My first attempts involved using a Kodak Disc Camera bolted to the side of my Carl Goldberg Gentle Lady sailplane, and I took a few interesting acceptable quality photos of our Norwegian Fjord horse farm and surroundings. This camera met its demise when the Gentle Lady suffered from a servo failure, and went into an uncontrollable spin into the ground from a high altitude. For a few years after that, I didn’t do any aerial photography until I finally assembled a new camera system based on an old 110 Pocket Instamatic camera that my wife Lori had ordered from the back of a cereal box when she was a kid. What follows is a collection of some of the better photos I’ve taken with this camera, which is attached to my Sig Riser 100. A few of these photos have appeared on my other aerial photography pages: summer and winter. 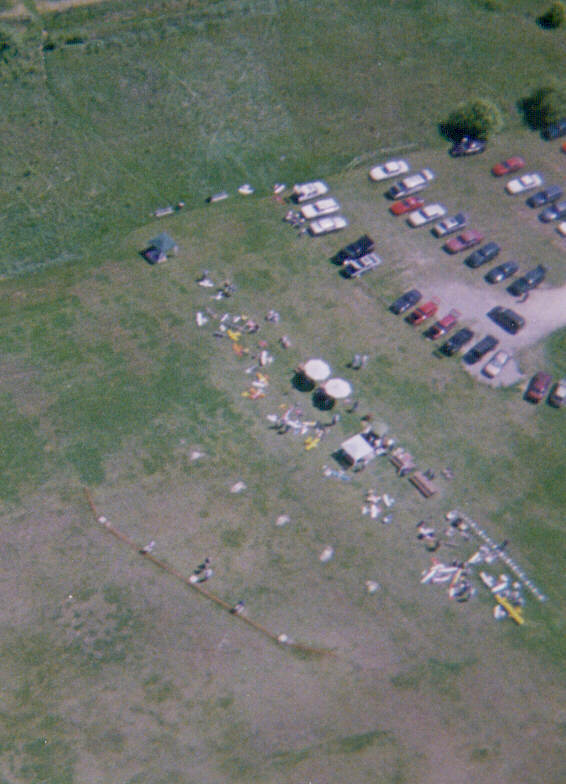 This first picture was taken during the May 1998 EMFSO fun-fly in Oakville. From left to right, you can see the flight line, pits many models, and the parking lot. Next is a photo taken from over my house, which is not in the picture. The flat area at the bottom left is our back field. 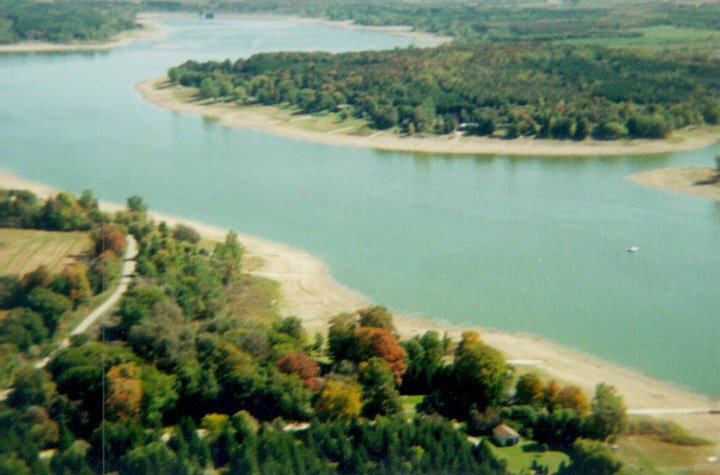 Above that is a group of cottages, followed by a section of Conestogo lake, and more cottages on the other side. The lines going into the water are boat ramps. 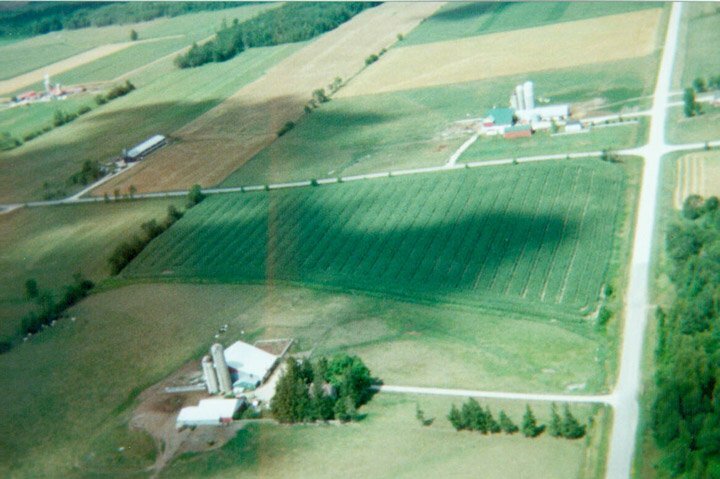 In this photo, we see two farms off a road near our farm. 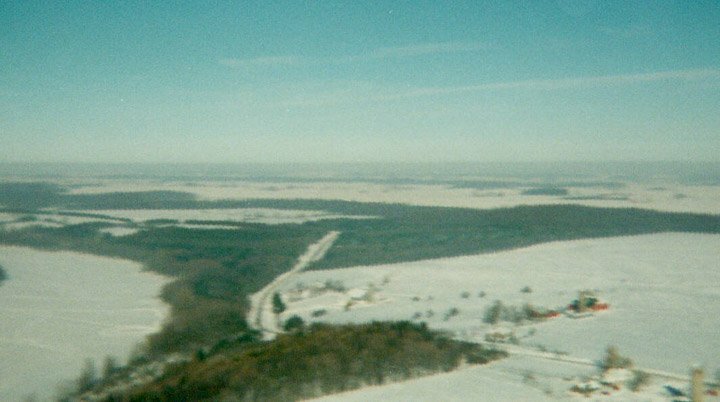 I was flying from a field belonging to the farm at the bottom of the picture, since my own field had just been plowed at the time, making it unsuitable for landing. It was a beautiful sunny day, with large puffy clouds in the sky, and you can see the shadows of the clouds on the ground. 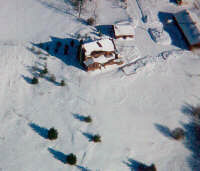 This is a photo of my house, taken after a big snow storm last winter (1998-99). Just above and to the right of our house is the garage. At the top right corner of the picture is our barn. You can clearly see the areas where the snow has been cleared in the driveway and parking areas. Here is another winter photograph, looking north west from our farm. You can just see our neighbour’s farm at the bottom right corner of the picture. The white area at the left side of the photo is the lake. The road we live on starts at the bottom right side of the photo, going diagonally towards the middle, and then curving back to the right, cutting through the woods. Now we’re back into the summer. 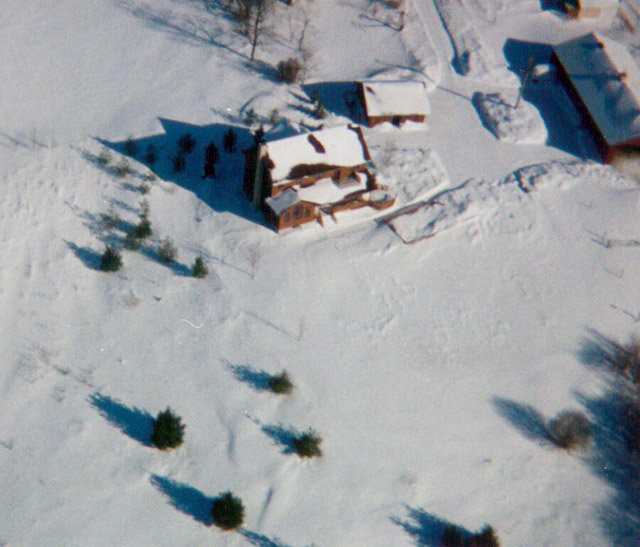 This photograph is of the farm belonging to friends of ours in New York state. The large building is their barn and riding arena. The small building attached to the upper left corner of the barn is their house. 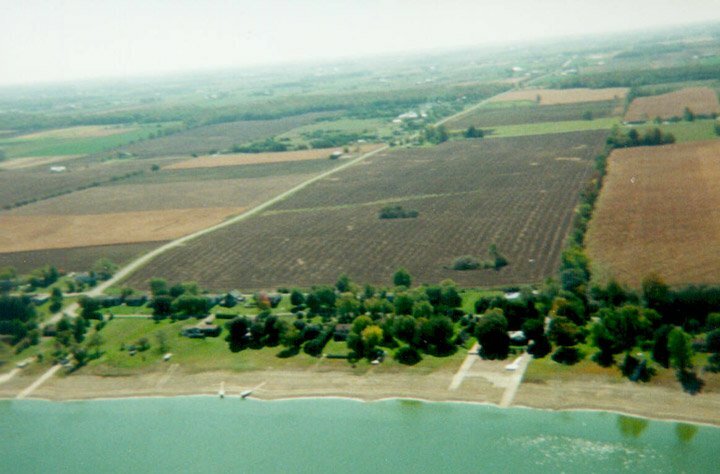 The building at the top left, with the “wagon wheel” around it is a run-in shed for horses, with six wedge-shaped paddocks. This little lake is near the farm from the previous photo. I’m not very familiar with the area, so I don’t know which direction it’s in, although I’d guess north-east judging from the shadows and the fact that I took these pictures in the early evening. You can see there is vegetation growing out of the water. 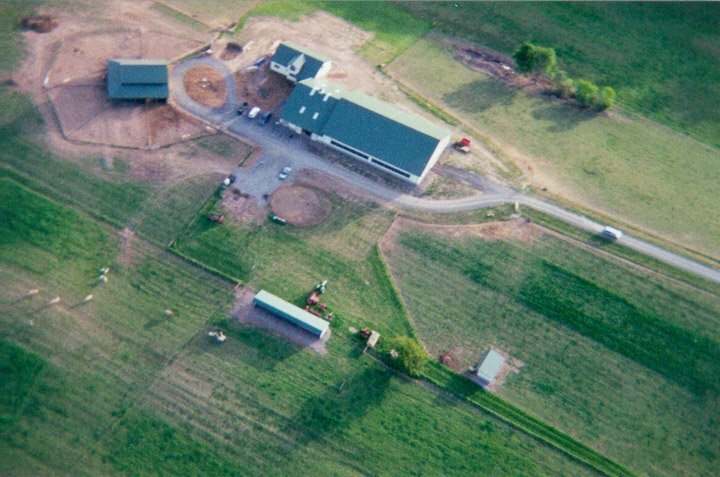 During the summer of 1999, we built an addition onto our barn. It used to be just a long rectangle, but now it’s L-shaped, with room for six more horses. 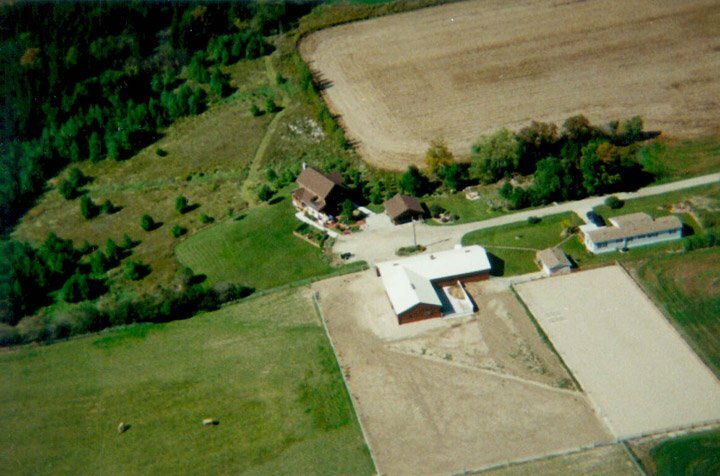 You can see our house and garage above the barn, and my mother-in-law’s house at the right side of the photo. The large grey rectangular area is our riding ring. A few horses are visible in the pasture at the lower left. This is by far the most spectacular aerial photo I’ve taken yet. 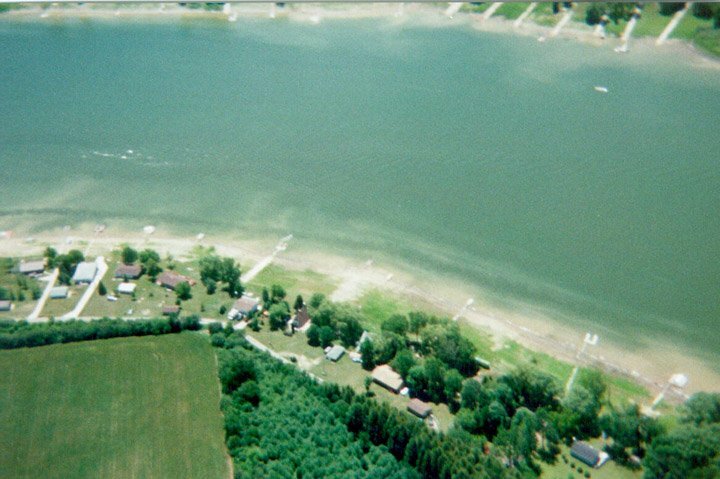 The view is from over our house, looking south across Conestogo lake. Having a photo like this of your surroundings really gives you a sense of how everything fits together. Here’s a nice view of almost the entire lake. 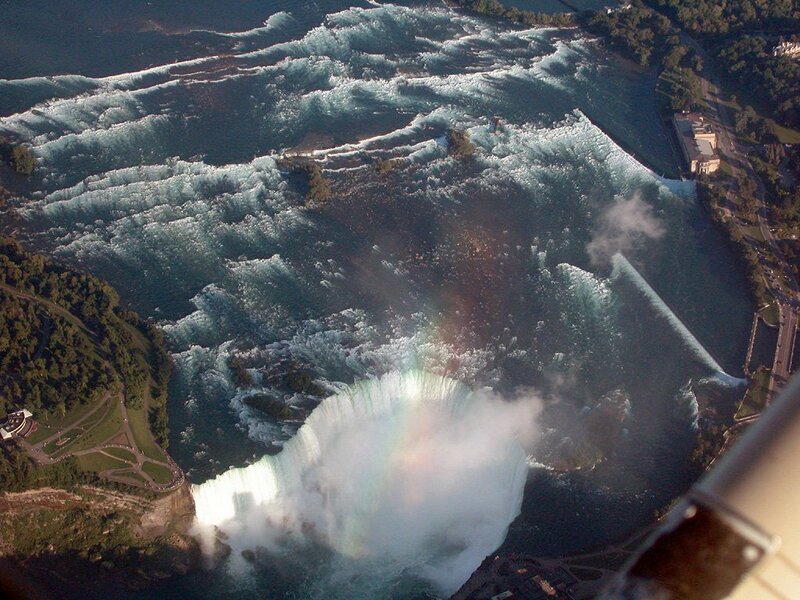 At the top of the photo, you can just make out the dam, without which the lake wouldn’t be there. This lake is used for flood control. 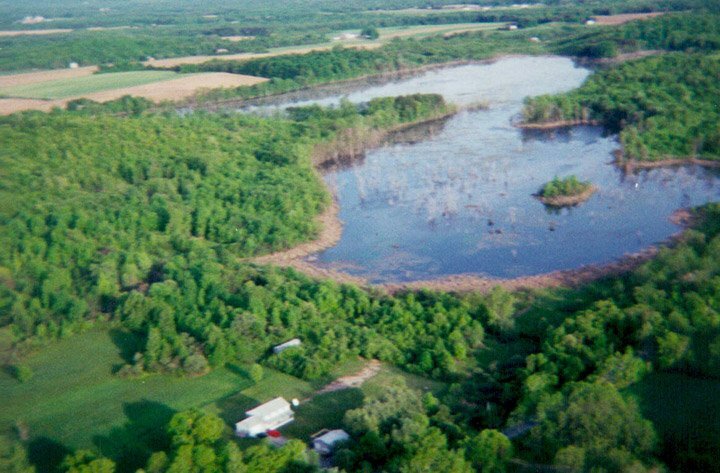 It is drained in the winter, and allowed to refill in spring time to avoid flooding the Conestogo River valley. The dam was built, I believe, in 1957. So, how did I take all these pictures? As I mentioned earlier, I used a 110 Pocket Instamatic camera, which uses a little film cartridge. The films are available in 12 and 24 exposure cartridges, but only with a 200ASA speed. The camera is fixed focus, fixed exposure, fixed aperture, with a plastic lens. These certainly aren’t the highest quality photos in the world, but they turn out remarkably well. The camera itself is built into a mounting bracket, made from 1/16″ plywood. The bracket also holds a regular sized servo, which operates two pushrods. One pushrod clicks the shutter via a bellcrank made from a servo horn. The other pushrod activates the film advance slider (not visible in the picture). The entire assembly is bolted to the side of my electrified Sig Riser 100. The C.G. of the camera and that of the plane coincide, so adding the camera does not upset the balance. The presence of the camera has almost no noticeable effect on the plane’s flight characteristics. I’ve programmed my JR XP642 transmitter so that the Channel 5 switch activates the shutter, and the Channel 6 switch advances the film. To take a picture, I flick the Channel 5 switch once, and then the Channel 6 switch twice. 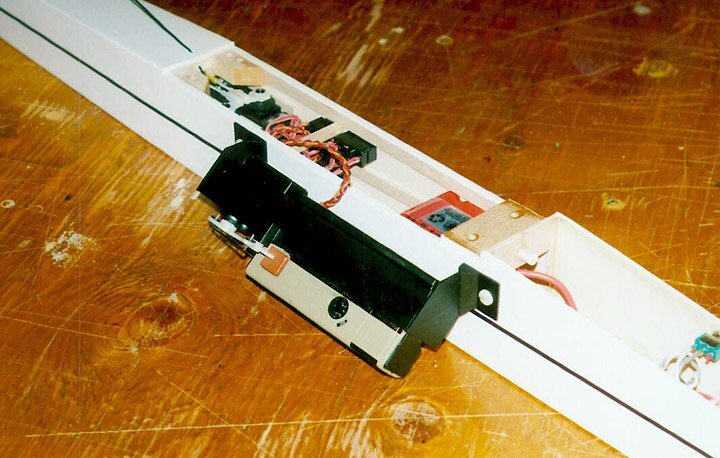 If your radio has adjustable end-points, you could also program the rudder stick (assuming you’re using the aileron stick to control the rudder) so that moving it one way takes a picture, and the other way advances the film. Aiming the camera takes a bit of practice. My earliest attempts usually yielded only about five or six good pictures from a 24-exposure film. Now I usually get at least a dozen decent photos. Because of the small, low quality lens, and small aperture (to get a large depth of field), the exposure time is relatively long, so it’s easy to get a blurry picture if the plane is turning at the time that you trip the shutter. In 2000, I’m hoping to do some aerial photography with an Advanced Photo System camera (such as the Kodak Advantix F300 I got for Christmas). These are also quite small and light, but the film is larger (24mm), and comes in a variety of speeds, up to 800ASA, so I should be able to get some much sharper pictures. Well, I never got around to using the APS camera. Instead, the digital revolution took over. I bought a cheap low resolution (640×480) digital camera in 2001, but never got around to putting that on the plane. Unfortunately for my R/C aerial photography exploits, I got my private pilot license in 2002, and now do all my aerial photos with an 8-megapixel Nikon Coolpix 8700 poking out the window of a Cessna 172 or Diamond Katana. Needless to say, I get much better pictures this way. The picture at right was taken with a 5-megapixel Nikon Coolpix 5400 (if you click on it, you’ll see a 1024×768 version, not the 2560×1920 original). If it wasn’t for that though, I’d probably attach a small digital camera like the HP R607 4-megapixel one to my glider and use that. It has the advantage of not requiring a film advance mechanism, and you don’t have to spend money developing pictures that didn’t turn out. If you enjoyed these photos, you might also want to take a look at Summer Aerial Photos and Winter Aerial Photos. There are also some more aerial photos taken from a full-scale airplane in my Aviation Photo Gallery.